Arizona, Joyce Vidal-Thornburg, the Director there, is beginning a new training program for spiritual directors this October [check the website for details]. Joyce is developing a pilgrimage to Ireland/Iona in June 2019 and both Catherine and Douglas will be helping her along the way. The pilgrimage is currently fully subscribed, but if you have an interest in being on a waiting list, be in touch with Joyce at jvidal460@gmail.com. Central California: Todd Minturn, the Director there, has renamed the CFDM affiliate “Hole in the Rock Ministries.” Todd, along with faculty Lynn Baker and Douglas Gregg, are finishing the first year of a two year-training for spiritual directors and Todd is offering quarterly retreat days [see website for details]. Our current monthly contemplative days [3rd Saturday of each month, at various churches, which we call “Going Deeper”] continues to be strong, with good attendance, as we are building a contact list of those interested in contemplative practices. October’s Going Deeper will feature a 3rd session on the Enneagram, and in November, Douglas will be introducing the “Welcoming Prayer” contemplative practice. If you aren’t currently on the contact list, and want to be, let Douglas know. The team in Northern Nevada —Jacci Turner, Joan Peyser, and others—has set dates for a 3rd training of spiritual directors in Nevada, beginning in October of 2019, and is calling for a “CFDM leadership summit in January to “brainstorm” the future of CFDM in Nevada [see their website for details]. Southern California: Care Crawford, the Director there, is again planning the “All Shall Be Well” conference” on Saturday, February 9, 2019—details on their new website [listed above] and/or the Bel Air Presbyterian Church website. And Larry Warner, the former director of our training in San Diego, has a new book out about his Journey with Grief, now available in paperback or as an e-book. It contains many of the poems Larry wrote following the death of his son, Nathan, as well as helpful suggestions for those navigating the first year of loss and an entire section on how to come alongside—physically and practically—those who are suffering after a loss of a loved one. 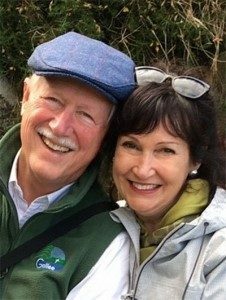 Northwest: Terry Tripp and her team in the Northwest, continue to offer spiritual direction training, formation training, and ongoing training in spiritual practices. Each year they offer workshops and one-day prayer events for all who are interested. Check their website for details about forthcoming events. The Gregg’s: Since we last wrote to you in late July, we have been busy with travels and the details of living—seeing directees, hosting friends and family, cataract surgery [Douglas], wellness visits with our doctor [we are both in great shape for our ages], travels to Hawaii and Northern California [Catherine’s “work” for which Douglas gets to be her “companion”], a cooking class, and Catherine has taken her final exam for her level one sommelier [wine tasting—according to Douglas, she is “a great taster,” for wine and other things we both enjoy]. See a picture below of the sunset over Waikiki Beach taken from our hotel room. A highlight of the past few months: I [Douglas] am not sure how many of you remember the 10- year old Christmas film titled “Love Actually.” The opening scene has the main character, Hugh Grant, in voice-over, talking about the problems we currently face in the world, and then he says, “But LOVE ACTUALLY is all around,” [from which the title of the movie comes], as we see scenes of the welcome hall at Heathrow Airport in London where people are greeting one another with love and affection, hugging and kissing each other, in demonstration that love actually is all around. Well, I had my “love actually is all around” moment a few weeks ago on the way to a Conference in Northern California at Bishop’s Ranch [a retreat center near Healdsburg, CA]. We left a day early so we could visit our ex-son-in-law Peter at Valley State Prison. There was such love being expressed in the visiting room as friends and relatives visited their loved ones behind bars. At one point I stood up and said [probably mostly to myself]], “love wins!” It seemed so obvious to me at the time that love, within the great suffering that is our prison system, would be more than enough to redeem the suffering. I’ve returned to this moment often in the past few weeks, as I’m wanting to be more present to what’s happening right in front of me—the flowers in our garden, the sunshine on my cheek, the love of my wife, the gift of still being able to walk, choices I still have, stained glass art. I’ve always been so future oriented that I used to joke that “I can’t enjoy today because I already enjoyed it last week. No more! In the face of our bitter partisan cultural battles and my aging process, I’m choosing to be open to the new possibilities that life brings, instead of turning into a bitter and cynical old man. I must say, some days I do better than others at my choosing. We are both thankful for the energy and health to stay in the rhythm of our current ministry assignments. Douglas is set to retire on his birthday in August 2019. As many of you know, Catherine’s current boss, Bishop Dan, with whom she loves working, is retiring at the end of this year. What is next for her is still to be revealed. We both hope to stay active with CFDM Affiliates as we are able, and Catherine is having increasing invitations to do workshops and seminars, especially around Celtic Spirituality. She remains open to hearing her next call when it becomes clear. Until then, we continue to wait, as patiently as possible, for the future to come to us, instead of trying to make something happen.